As this TV commercial shows, QR codes make it a doddle to access web pages on your mobile phone, but they don't make very good “Magic Eye” pictures. A QR (“quick response”) code is a two-dimensional barcode that allows information such as web page URLs and email addresses to be extracted quickly and accurately from printed documents without the hassle of having to type them in with a keyboard or telephone keypad. Most mobile phones on sale today are capable of running QR code reader applications. QR codes are particularly common in Japan, where they were invented by a Toyota subsidiary called Denso-Wave in 1994. Their website contains a more detailed description of these codes (in somewhat broken English). Do I need one on my business card? Not necessarily. 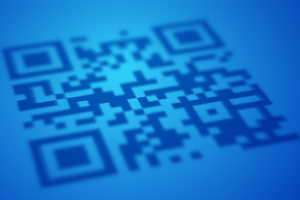 According to the results of a 2007 survey by internet.com and goo research in Japan, less than 3% of people own a personal or company business card with a QR code printed on it (Japanese article; English auto-translation is available). As a rule, I wouldn’t recommend adding a QR code unless you’re expecting to deal with people that are quite knowledgeable about internet technology. It’s possible to create a QR code containing all sorts of information such as your name, address and phone number. The problem with this approach is that the more information you add to a QR code, the larger it gets. Smaller codes stand a better chance of being readable on mobile phones with low-resolution cameras, so keep the information content down to a minimum. You can do this by encoding just a single item of information, such as your email address or the URL of a web page containing your contact information (perhaps containing a link to a downloadable vCard). URL shortening services like tinyurl.com, bit.ly and goo.gl may come in useful here. If you provide a URL, you can edit your details at any time without having to change the QR code. Make sure the page you’re linking to is compatible with mobile phone browsers. Ideally, you should link to a Japanese-language page so your clients can find their way around. Here’s an interface to Google’s chart API that you can use to generate your own QR codes. Just type or paste the information you want to encode (e.g., a URL or email address) into the text box below and click the “Generate” button. The white margin around the outside is an integral part of the QR code. Don’t crop this space or print anything inside it. ▲ Header image: Ema (絵馬; votive plaque) at Kamigamo Shrine (上賀茂神社) in Kyoto. The characters 必勝 (hisshō; literally “certain victory”) suggest this was put up by a student preparing for entrance exams or job interviews. Photo: Frank Gualtieri.